Macaws are the biggest tropical parrots, up to three feet from head to tail. They're perhaps the most colorful Amazon birdsin character as well as plumage! Although we think of them as good "talkers" (actually they mimic speech), most of the time they call out with incredibly deafening screeches. Painful if you're standing close by, but useful for birds that need to maintain contact with the flock in the dense canopy, because these are intensely social birds. When observed in the wild, they are usually flying in pairs, commuting between feeding grounds and favored roosting areas. Besides being amusing companions, macaws are popular subjects for local artists (see painter - blue and yellow macaw). 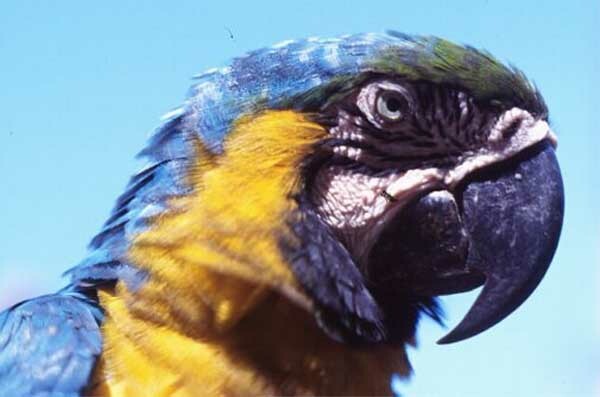 The Blue and Yellow Macaw, also called the Blue and Gold Macaw (Ara ararauna) is one of seven species of Amazon macaws. 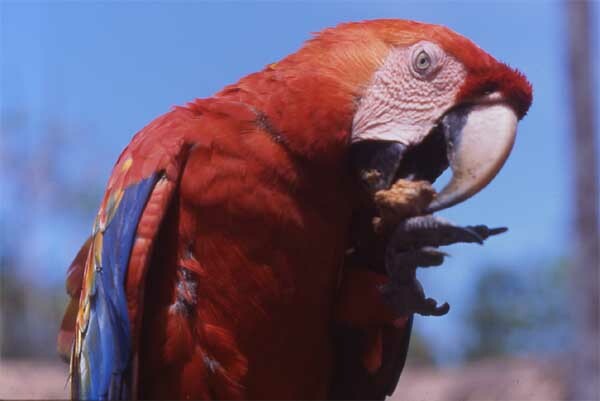 Macaws differ from parrots in having a patch of bare skin at the base of the bill. In the Amazon, you may see these birds around lodges and hotels where they are attracted by food. At some lodges they are free to come and go, and this gives a good opportunity to observe them up close in relatively natural conditions. However, these birds do poorly in captivity and should not be kept as pets. The Scarlet Macaw (Ara macao) is the quinessential Amazon bird. As with other parrots it is adept at using its claws to feed on hard nuts, which its powerful beak can easily crack open. They like to eat palm nuts, but in captivity they also eat fruit such as bananas and papaya. In the wild, macaws flock to exposed river banks to eat red clay (see parrot clay lick). Why they do this is uncertain. It may be to get additional minerals or, as some scientists believe, it is to detoxify the poisons ingested when the parrots eat certain seasonal plants.